I like to make a big tray of this and if there's anything left over it can be eaten the next day when it tastes even better. Even if you don't want it the next day, you can freeze it in portions and then you have a tasty meal for days when you may not have time to cook. You should allow about 45 minutes to an hour to make this dish but most of that time it is just baking in the oven. Can I use any alternatives if I can find certain ingredients? Aubergines are readily available these days. I suppose you could replace aubergines with something like courgettes (zucchini). I'm not sure you would get the same result though as it really is the unique texture of the aubergines that make this dish. What preparation do I need to do / what can I do in advance? The aubergines should be cut length ways into 1cm slices. Depending on the aubergines and their water content you may want to salt the slices and cover with a dish to draw out excess water. However, this is not normally necessary these days. For the fresh tomato sauce please follow this recipe using normal size tomatoes instead of cherry tomatoes and using onions and garlic. What are the main steps? Fry the diced pancetta over a medium heat in olive oil. I like to cook the pancetta well until crispy. Meanwhile heat a pan of salted water for the pasta and add the spaghetti when the water starts to boil. Cook spaghetti in accordance with instructions. Fresh pasta should only take about 5 minutes or less, dried pasta will take much longer. Drain the pasta once it is al dente (reserve some of the cooking water) and add to the pan with the pancetta. Reduce heat to very low. Pour egg and cheese mixture over the pasta and mix well. Be careful not to allow the eggs to scramble! Add some of the reserved cooking water if it becomes too dry. How should I serve it? Serve in bowls with extra sprinkling of Parmesan and some black pepper to taste. Some people like to drizzle a few drops of some good quality olive oil over the dish too just before serving. Are there any variations to this recipe that I could try? You could try using a different cheese such as a Fontina which is a tasty cow's milk cheese from Northern Italy. It could be used as an alternative to mozzarella. What are the origins of this recipe? Traditionally this dish is served as a starter. There is some dispute as to the origins although it is most likely to have come from Sicily where the cuisine is heavily Greek influenced and the aubergine features highly. Those in the North (from Parma / Emilia Romana) argue that use of "Parmigiana" means it must come from their region (the home of Parmesan cheese). 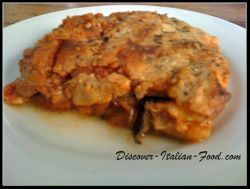 While Sicilians argue that its origin is in fact from the word "Parmiciana" (which is their word for the layered wooden shutters of their region which reflect the layers of the aubergine in the dish). Like this recipe? Why not share it with friends on Facebook?